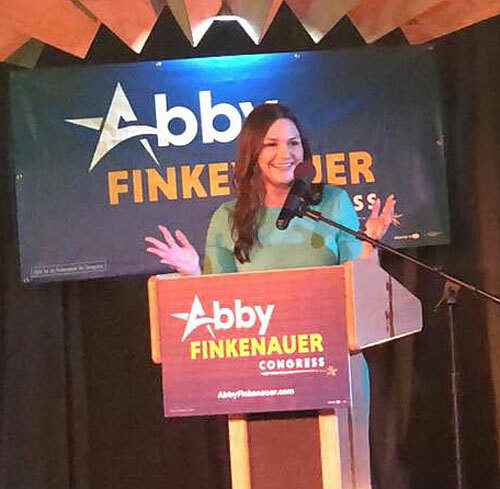 Facebook photo of Finkenauer addressing supporters. Iowa Secretary of State Paul Pate says text messages containing false information about Tuesday’s primary election were sent to Iowans by a vendor working for Abby Finkenauer’s congressional campaign. “We worked with the campaign and their vendor. We believe it was an error in their data management and the texts were not malicious in nature,” Pate told Radio Iowa today. The texts gave the wrong polling locations for some voters in that district. Pate said the vendor did not use a “current” voter registration list — so a voter who had moved may have been sent the address of the precinct in their old neighborhood. Pate suggested voters should depend on something other than a text message if they’ve moved or are voting for the first time. Finkenauer won about 67 percent of the votes in the Democratic primary in Iowa’s first congressional district and will challenge Republican Congressman Rod Blum this fall. Finkenauer’s campaign manager issued a written statement about the bad texts. He said “a few dozen people were sent inaccurate polling locations unintentionally,” but the campaign is “deeply disturbed this happened” and apologizes for the confusion. Once the error was discovered, a second message was sent directing voters to the polling place locator on the Secretary of State’s website.